Organized in 1842, the New York Philharmonic is one of America’s oldest musical institutions whose record-setting 14,000th concert was given in December 2004. 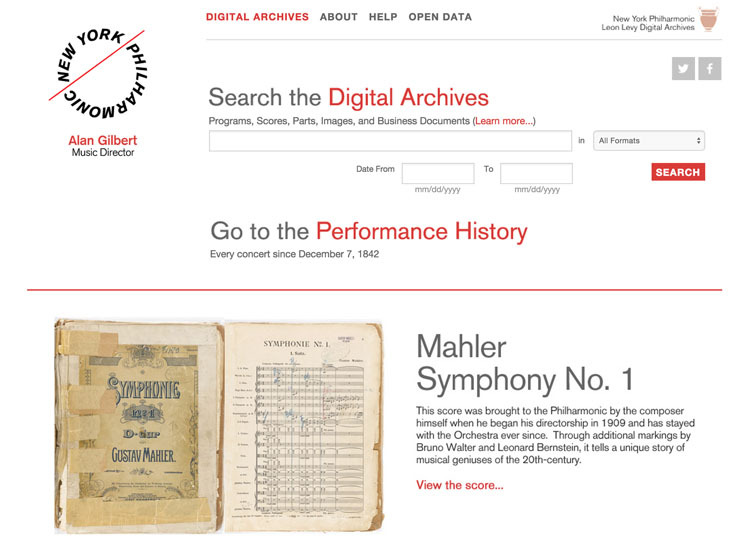 The New York Philharmonic Archives consists of more than eight million items, including 3,236 printed programs, marked conducting scores, business documents, and photographs. In 2009, The Leon Levy Foundation funded a $2.4 million 3-year effort to digitize 1.3 million items relating to the life of Leonard Bernstein and the history of the orchestra. Of particular interest is Mahler’s 9th symphony music score with conductors’ notes from Toscanini and Leonard Bernstein. All documents and the photographs themselves have been photographed by Ardon Bar-Hama and his team using innovative and advanced techniques to achieve the highest quality.